Packing a comprehensive selection of production-ready sounds and effects, KOMPLETE 7 ELEMENTS is the perfect introduction to the world of KOMPLETE. This collection delivers studio quality tools at an unbeatable value, and is infinitely expandable with the ever-growing range of KOMPLETE Instruments and Effects. As it is, it comes with over 12GB and 2,000 premium sounds from the KOMPLETE Instruments and Effects collection, making it a ready-to-roll professional software bundle for all production styles. 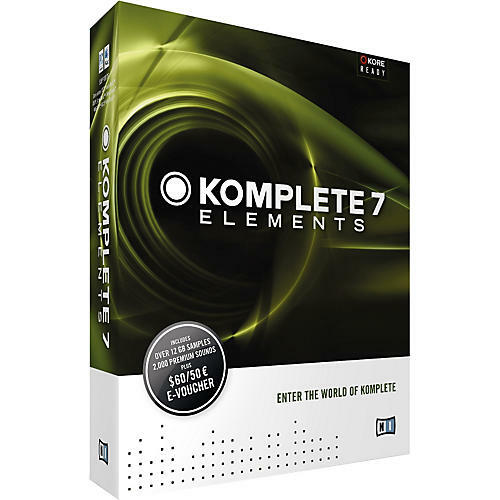 KOMPLETE 7 ELEMENTS boasts content from Vienna Symphonic Library Orchestra, plus classical percussion, a concert grand, and harpsichord. You also get exotic sounds from all around the world like bagpipes, flutes, sitar, kalimba, kora, steel drums, and more. Also included is a vast arsenal of band instruments: acoustic and electric pianos, guitars, organs, bass, horn sections, drum kits, plus a vintage 60s Gretsch kit beautifully recorded at Abbey Road's world famous Studio Two. Within the vast array of premium samples you will find 25 instruments inspired by vintage analog synthesizers, keyboards, organs, string synths, or famous drum machines like the TR-808/909, CR-78, and others. KOMPLETE 7 ELEMENTS also features an exclusive selection of 21 unique contemporary synths, 6 different synthetic drum kits, plus 16 urban production kits”consisting of drum loops, single loop tracks, and the individual slices. KOMPLETE 7 ELEMENTS comes with 8 perfectly modeled classic amps, 19 cabinets, and the Matched Cabinet module for tried-and-true classic tone”just about every guitar sound ever recorded is at your fingertips. A collection of 27 professional effects”such as overdrive and distortion pedals, chorus, phaser, flanger, wah-wahs, reverb, and delays”can be combined in any order or quantity. REAKTOR has been distilled into REAKTOR 5 PLAYER to give you instant usability. The legendary instruments included are Photone, SpaceDrone, Aerobic, Carbon 2, Oki Computer 2, Metaphysical Function, Steampipe 2, Newscool, and REAKTOR SPARK. REAKTOR SPARK, designed by the originator of REAKTOR, Stephan Schmitt, uses controlled feedback to deliver a unique presence that cuts through the mix like few other synths. In total you get 555 amazing instruments and effects for KORE 2 PLAYER, including 200 of MASSIVE's bulldozing basses and piercing leads, as well as 200 strikingly beautiful pads and soundscapes from ABSYNTH 5. Each sound has 8 distinctive variations making this collection a vast and powerful studio weapon with a total of 3,200 sounds. KOMPLETE 7 offers an enormous range of premium sounds in just about any category of instrument. Moreover, the arsenal can be expanded at any time with products from the KOMPLETE Instruments and Effects range. For this reason, KOMPLETE 7 includes an e-voucher worth $60/50 for the NI Online Shop.